Intel (INTC) was incorporated in 1968 and is the largest manufacturer of semiconductor chips in the world. Intel’s primary products are microprocessors and chipsets. Desktop and notebook computers accounted for 53% of Intel’s sales last year but have been shrinking as a percentage of overall mix as PC demand continues to gradually decrease in favor of tablets and smartphones. The remaining 47% of Intel’s business comes from data center processors, flash memory chips used for computer storage needs, and other chips that improve the computing performance of electronics in cars and other devices and equipment, including many Internet of Things (IoT) applications. These businesses are enjoying strong double-digit growth, driven largely by gains in data-centric businesses. Importantly, chips used in servers are much more profitable than those used in PCs. As a result, 53% of Intel’s operating profits come from its data center business, which continues a multi-year trend of diversifying away from PC chips. Intel has paid uninterrupted dividends for 20 consecutive years and raised its annual payout for four consecutive years. In recent years Intel’s microprocessors have been used in over 80% of global PCs sold each year, according to Bloomberg. Similarly, per Statista, the company has close to 80% share of the $16 billion-plus global market for server chips that run instructions called x86 that power almost all commercial software. How has Intel amassed such a dominant share in these huge markets? Developing and manufacturing microprocessors is extremely complex and capital intensive. The manufacturing process requires hundreds of steps in “cleanrooms” which, according to Intel, contain air that is 1,000 times cleaner than a hospital’s operation theater. Building a single plant costs roughly $5 billion today and will only increase in cost going forward. Research and development costs are also astronomical in the semiconductor manufacturing industry. For example, Intel spent more than $13.5 billion on R&D in 2018, representing 19% of its total sales. The company's capital expenditures totaled $15.5 billion in 2018, and Intel has spent nearly $200 billion on R&D and capital expenditures since 2005. Few companies can match those kinds of financial resources needed to design and manufacture some of the most complex electronics in the world. Intel’s investments have allowed it to historically introduce the next generation of process technology every two to three years, improving the performance of its chips at a breakneck pace that most competitors cannot afford to keep up with. The company's latest server chips offer excellent performance enhancements with far lower power requirements, which management says results in 25% lower operating costs for customers over three years. And its storage chips have about 65% lower operating costs over three years, which explains why Intel's data center server chips are so widely adopted. In addition to spending on manufacturing plants and R&D, competitors and new entrants must contend with the strong reputation of Intel’s brand, which Interbrand estimated was the 11th most valuable in the world in 2018, worth over $43 billion. Intel’s architecture has been refined for decades, and the company has funneled well over $100 billion dollars to continue improving it. As the incumbent technology in PCs and data centers, Intel’s processors have effectively locked up customers. For example, when Dell develops a new computer, there is no compelling incentive to switch to a different processor family as long as the previous version worked and the next one offered by Intel is even better. Many legacy applications run on Intel’s technology, and switching would be costly in many cases. Inertia is often a powerful factor in these markets as well, making it even more difficult for a real challenger to Intel to emerge. As the industry’s giant and only viable supplier in many cases, Intel has largely controlled the pricing of its chipsand can exert pressure on Advanced Micro Devices (AMD), its only large competitor in PC microprocessors. 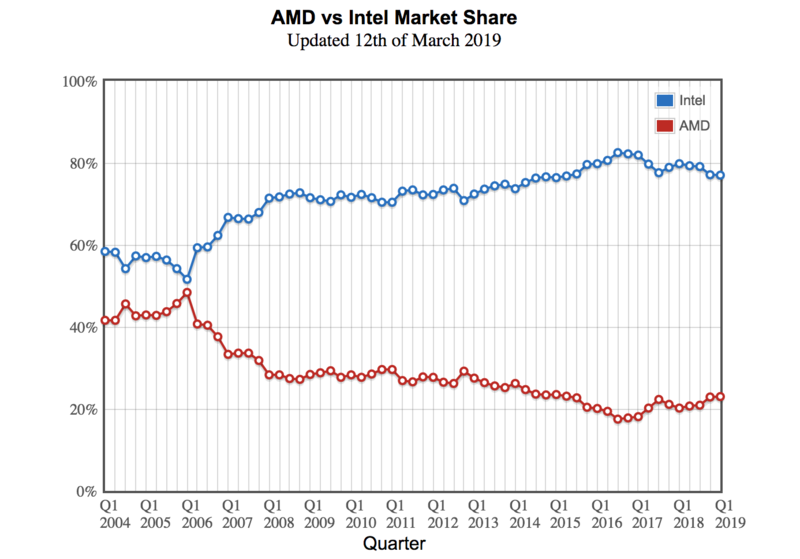 As seen below, for more than a decade Intel’s market share has risen significantly at the expense of AMD. With less scale than Intel and a weaker technology portfolio, AMD has struggled to compete and actually spun off its manufacturing business in 2009 in an effort to improve profitability. To retain its leading position in the PC market, Intel will also be revamping its core architecture (x86 processor). Intel’s leading PC technologies have also provided the foundation for the company’s expansion into the data center and Internet of Things (IoT) markets. Importantly, Intel’s PC business provides an incredible scale with $37 billion of revenue and possesses substantial intellectual property that translates over into other electronics such as servers. This gives Intel an advantage once again over smaller players with inferior manufacturing processes. However, it doesn’t guarantee Intel’s success in dominating these markets either. Given a slowdown in the PC total addressable market, Intel is shifting from a PC-centric focus to a data-centric focus. More than 50% of the firm's total revenue now comes from data-centric businesses, which are growing at a double-digit clip. Solid growth in Intel’s data center operations is expected to continue. The company’s top four priorities going forward are growing its data center and adjacencies businesses, ensuring a strong and healthy PC business, growing IoT and devices, and flawless execution in memory and field-programmable gate arrays (FPGAs). One move Intel made to strengthen its position in data centers and IoT devices was its acquisition of Altera for $16.7 billion in 2015. This deal helped Intel gain exposure to FPGAs, a more flexible type of semiconductor chip that could account for as much as a third of the processors in all data centers by 2020. By purchasing Altera (now known as Programmable Solutions Group), Intel can stay in front of this potential development and deliver customizable, integrated products that help improve data center operators’ performance and power efficiency. In a bid to further diversify away from PCs and enter the autonomous vehicle market, which analysts believe could reach $100 billion by 2030, Intel agreed to acquire Mobileye for $15.3 billion in 2017. This Israeli company is a leader in developing camera-based software for autonomous driving, and the combined company will be able to also provide sensors and processing and communications systems. Intel has signed a memorandum of understanding with automobile giants BMW Group and Fiat Automobiles to develop an autonomous driving platform. By the end of 2017, MobileEye was already in 24 million cars around the world. 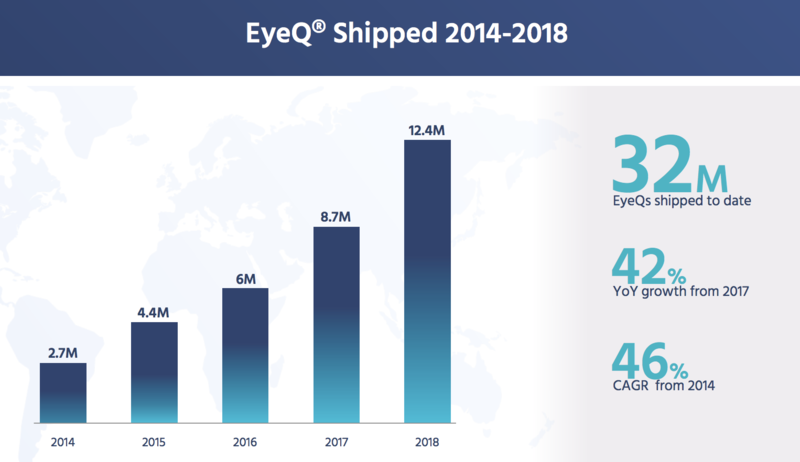 That figure is now certainly higher given that the company's EyeQ product saw over 40% sales growth in 2018. Autonomous cars are just one part of the IoT landscape, but NVIDIA believes the addressable market could reach $60 billion (120 million vehicles) by 2035. Should these forecasts play out and Intel remain an important player with some of the components, the company could presumably tack on several billion dollars of incremental revenue growth over this period (compared to about $71 billion in annual sales today). One reason to be optimistic about the firm's driverless car chips is that under Intel's ownership the EyeQ chip's capabilities have increased exponentially, with an impressive 72-fold increase in processing power compared to the 2014 version. By 2022 management says it wants its MobileEye chips to be in fully self-driving cars (initial rollout in Israel and China). Starting in 2023 Intel plans to start mass production of autonomous vehicle chips for global distribution. Simply put, Intel’s acquisitions and organic expansion efforts have significantly expanded its addressable market well beyond PCs, to hit a total addressable market of $250 billion by 2021. When combined with management's cost-cutting efforts to reduce expenses from 35% of revenue to 30% by 2020, Intel seems likely to remain a cash cow for a long time to come, even if the PC market deteriorates further and data center growth slows. For example, management is guiding for $16 billion in free cash flow in 2019, up 12% from $14.3 billion in 2018. Intel has historically been very generous with returning free cash flow to shareholders as well, including $9.8 billion in buybacks and $5.5 billion in dividends in 2018. Through 2020 the company hopes to achieve low single-digit revenue growth with stronger EPS and free cash flow growth. This will be made possible by improved margins created by expanding economies of scale and lower capital spending. Overall, Intel’s scale, world-class manufacturing processes, long-standing customer relationships, massive intellectual property portfolio, early-mover advantage in PCs, and a strong reputation for quality have helped it essentially monopolize the market for PC processors. The company is using its advantages in the PC market to extend into data center processors, which it also dominates, and is trying to crack into Artificial Intelligence and Internet of Things devices (including driverless cars) to continue its long-term growth. While it will likely take years to evaluate the success of Intel’s major acquisitions of Altera and Mobileye, as well as the company’s increased push into more data-centric applications, where competition is fierce, Intel is certainly a force to be reckoned with. However, there are still several major risks to consider. In 2018 Intel suffered some setbacks in its manufacturing which allowed rivals like AMD to gain market share. Specifically, the company struggled to supply enough 14 nanometer (nm) PC chips and experienced delays in launching its 10 nm chips (now expected to arrive in late 2019), causing it to be unable to meet all customer demand. This highlights the fact that in the complex world of chip manufacturer, bringing new designs to market on time and in sufficient volume (to maintain its market share lead) isn't always easy or possible. For example, Intel had previously said its latest generation 10 nm PC chips would be available in late 2018, but that time table now appears delayed by a year. Overall, this latest generation of chips is now several years late. The costs of such hardware delays can be severe, with European company MindFactory reporting that AMD's CPU market share rose to 65% in late 2018. In the broader desktop market (where Intel has historically dominated) AMD is expected to gain about 10% market share (to 30%), reducing Intel's market share in PCs from 80% to 70% in 2019. A good deal of Intel's market share loss to AMD in CPUs was due to both insufficient supply as well as steep price increases the company enacted at the end of the year. However, that suggests Intel's wide moat has its limits when it comes to pricing. Strong pricing power offsetting falling desktop chip volumes has been a key sales and earnings growth driver for the company that it may not be able to continue using in the future. It's also worth noting that the world has changed a lot since Intel incorporated 50 years ago. For one thing, computers were extremely rare and largely unavailable to the public. The first microprocessor didn’t even exist until 1971. Today, computers are everywhere, and relatively new devices such as tablets and smartphones are beginning to erode total demand for Intel’s legacy cash cow – PCs (around 50% of operating profits). If demand falls faster than expected, Intel’s profits could struggle to grow. And while Intel is still growing earnings and free cash flow relatively quickly its dividend growth rate hasn't kept up, thanks to its penchant for big buybacks. For example, in 2019 Intel hiked its dividend just 5%, less than half as much as it's expected growth in 2019 free cash flow. The point is income investors need to have realistic expectations about Intel's dividend growth, which has averaged 6% growth over the last five years, compared to 21% over the past two decades. This is largely driven by the fact that Intel's legacy PC business is probably going to face secular declines from now on. According to analyst firm Research and Markets, between 2017 and 2022 global PC volumes are expected to decline from 325 million per year to 308 million. This suggests the secular decline in the industry, created by the rise of mobile devices replacing desktops, is likely to be permanent. In 2018 Intel's desktop platform volumes fell 6%, bu this was offset by an 11% increase in average selling prices. However, strong pricing power can't make up for falling demand forever, so PCs could remain a drag on Intel's overall growth rate in the future. In fact, the company's 2019 guidance calls for flat sales and earnings growth, with free cash flow rising due to lower capex spending. Intel benefited for many years from the rapid ascent of computers, which drove strong demand for its microprocessors. However, the company is now relying on other growth drivers to remain competitive, especially if the market for PCs contracts faster than expected. As noted earlier, Intel is performing well data center processors and expects to benefit from the market growing to $65 billion by 2021. The company is also working to capture meaningful market share in artificial intelligence and a broad array of IoT devices. Intel is leveraging the scale and intellectual property from its legacy PC business, but that certainly doesn’t guarantee its success in gaining a strong and profitable position in these emerging, fast-growing industries. Intel’s push into these industries is also pitting it against competitors and threats it didn’t previously face in the PC market. Perhaps most notably, cutting-edge tech giants such as Facebook (FB), Apple (AAPL), and Alphabet (GOOG) have increasingly expressed a desire to make their own chip designs and leverage other suppliers to push back on Intel’s pricing. And most recently Amazon (AMZN) has announced it was planning on designing its own AI chip. These firms are well aware of the monopoly profits enjoyed by Intel and increasingly view hardware as a performance differentiator, increasing the incentive to develop their own intellectual property and processes. Intel already has a large custom chip business, but it’s worth remembering this risk factor. The biggest competitive threat to Intel’s data center processor business, which is responsible for driving the vast majority of the company’s profit growth, is arguably ARM Holdings. ARM uses a different architecture than Intel and currently dominates the smartphone market, which relies on smaller and more power efficient chips. Unlike Intel, ARM is a chip designer that makes money from licensing and doesn’t do any manufacturing. ARM also has a strong financial backing now, after being acquired by the Japanese multinational company Softbank. ARM-designed chips can be made in competing foundries such as those run by Samsung and Taiwan Semiconductors, who in recent years have made great strides in designing highly advanced and automated chip manufacturing plants. Basically, Intel's competitive advantages created by its enormous scale and manufacturing expertise is now starting to be challenged by well-funded global giants, including unique competitors like Amazon and Alphabet which operate in other industries. While these developments require some monitoring, Intel deserves the benefit of the doubt to demonstrate it can continue holding its ground like it has for decades. Another risk factor to note is that semiconductor technology is constantly evolving. Microprocessors become faster and more powerful each year while also shrinking in size and cost. While Intel is one of the only companies with the financial strength and reputation to invest in the best manufacturing processes and R&D, the pace of chip improvements has begun to slow in recent years as the physics of chips has become extraordinarily complex. If innovating in performance and power becomes increasingly difficult, the competitive gap between Intel and its competitors could begin to narrow. Intel could also begin to realize a lower return from its multibillion-dollar investments. Finally, Intel’s substantial acquisitions of Altera and Mobileye over the last two years create risk. These two deals are by far the largest in the company’s history, and the price tag was certainly not cheap; Intel paid around 140 times earningsand more than 42 times total sales for Mobileye, for example. It will likely take years to assess the success of these mega deals, which hinge on a number of assumptions made about fast-changing markets. If the future plays out differently than management expects, Intel will be left with less flexibility to adapt. The company's overall track record on M&A is mixed, with it paying $7.6 billion for McAfee in 2010, but then spinning off the majority of this business when it decided the deal wasn't working out as planned. While Intel has historically dominated the PC and data center markets, which have helped the company pay uninterrupted dividends since 1992, the computing world is undergoing broad changes. Rapid growth in the cloud, data consumption, and connected devices bode well for many of Intel’s business lines, but such fast growth, combined with Intel’s dominant market share and excellent profitability, is also attracting many old and new competitors. Investors seem more worried about profitable growth prospects in Intel’s high-margin data center business than they are about the continued erosion of the PC market, and it’s hard to fault them given the importance of this business as a growth driver and the high amount of uncertainty surrounding the dynamic competitive landscape. For now, Intel’s massive investments in factory equipment, manufacturing processes, and R&D have helped it largely stay ahead of its rivals to enjoy healthy pricing power and high margins. The company’s large acquisitions of Altera and Mobileye could also help it capitalize on new areas of profitable growth while strengthening its existing data center operations, but they also come with substantial risks. While Intel needs to continue its dominance in the server chips market and capitalize on its recent acquisitions to mitigate falling demand for PC processors, the stock should continue to serve as a reasonable source of safe income with moderate growth for a diversified dividend portfolio. Dividend growth investors just need to keep in mind that thanks to the company's love of large buybacks, dividend growth may not keep up with future growth in earnings and free cash flow. Anyone wishing to own Intel needs to have realistic expectations about its future payout growth rate, which will likely remain in the mid-single-digits going forward.